We all enjoy great music in events like birthdays, weddings and corporate occasions. 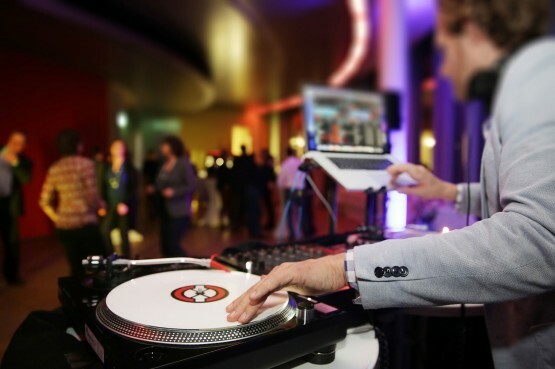 What better way to keep everyone entertained than hiring a DJ who has experience and knows how to engage an audience? We have entertainers who know how to keep their audience, no matter their age, on their feet throughout the party. It takes so much skill and experience to occupy any kind of audience for hours with good music. That’s why you need to hire a good DJ from Right Choice Children’s Entertainment. Partner with the best and finest DJ in Toronto for your party. At Right Choice Children’s Entertainment, we provide DJs for several occasions including weddings, birthdays and corporate events. Our DJs are renowned for using the latest technology and playing music that’s appropriate for their audience. Get attractive lighting and themed equipment that your guests will love. Create a fun-filled environment for kids and adults alike to enjoy by hiring a professional DJ. One thing you can always be assured of when you have a DJ at a party is that they’ll be non-stop music that is appropriate for your guests. If you have a younger audience, you need a DJ who knows how to interact with them and sometimes may be required to offer some MC services. The music played also has to be appropriate for the audience which is why we always recommend having a brief with the client to better understand their needs. We all enjoy dancing especially when we hear music we love. Furthermore, working with certain audiences such as the millennials requires a great deal of experience and commitment. That’s why the DJ we recommend comes with the skill and know-how to handle your audience. This will largely depend on the type of party you’re hosting. We’ll have to consider the kind of audience you’re targeting for your event. Factors such as the age, location, time of the year and what’s popular will help a DJ to come up with a suitable playlist. At Right Choice Children’s Entertainment, we have music masters and entertainers whose work is to narrow down the selection to suit any kind of party. We know that having the right DJ can make or break an event. This is especially true when it comes to pleasing younger audiences such as a group of 3 to 7- year-olds. Our DJs have got the talent and skills to get everyone on the dance floor. With our DJ, get ready to shut up and dance. We know what it takes to wow your audience regardless of their age. Our DJ can spin for hours during the party. We will agree on a suitable schedule that works for your guests. He’ll come with the right equipment and make sure appropriate sound levels are maintained to prevent it being unsafe for the ears. We know there’s more than one way to get everyone dancing their favorite tunes. Whether you are looking forward to a light show or you want music to play all through the party, our DJ is happy to fulfill all your needs. At Right Choice Children’s Entertainment, having served the Toronto area for many years, it’s safe to say we know a lot about events and parties. Most guests may not have the energy and stamina to party all night. That’s why you may only need to hire a DJ for a few hours. No worries because we’ll design a package that perfectly suits your needs. Whether you need our DJ to spin for one hour or three, we’ll be happy to keep everyone on the dance floor and see smiles on their faces. Get the finest DJ in Toronto for your event or corporate function today. You can hire our DJ and be guaranteed of an enjoyable experience. From excellent music to great dancing and state of the art equipment, what more could you ask for?